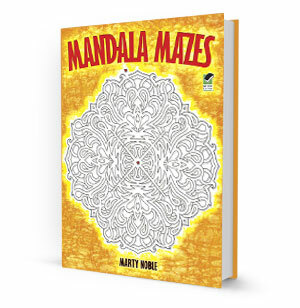 This unusual and challenging array of mazes features 36 intricate designs inspired by the mystical mandala. These mazes are neither too easy nor too hard -- in fact, they're perfect for puzzlists' ages 8 and up! Plus, the mandalas offer a wealth of coloring possibilities. Each maze starts at the little heart outside of the mandala. Work your way through the maze to the center and you are done! Now you can color the mandala in any way you want using crayons, pencils, or markers. Includes 36 intricate designs inspired by the mystical mandala. Images are beautiful and easy to follow. Can be colored with marker, pen, or even watercolor. Perfect for older children and adults. Age Range: 8 and up. Grade Level: 3 and up.